Over the last few months, it's become apparent to my husband that I have very specific plans for our next residence, aka my dream home. I'm a western girl and I've yet to find a single home in Northeast Ohio that fits my taste. Which inevitably means we'll have to build, of course. "Of course" he mocks. I'm going to spend the next few years trying to convince him that building isn't too much more expensive than buying an existing home and will offer us the abilities to customize the home to our tastes. While browsing the Internet for a home improvement client of mine I came across Eldorado Stone. More specifically, their CandleWallTM, which combines the best in natural design with the class and uniqueness I desire. I want friends and family to walk in to our dream home, feel like they've been transported back to Denver, and say, "why didn't I think of that?" all at the same time. I want it to feel like home to me. For those of you into a sleeker, more polished look. They offer a Coastal Reef version that turns your bathroom into a spa oasis. 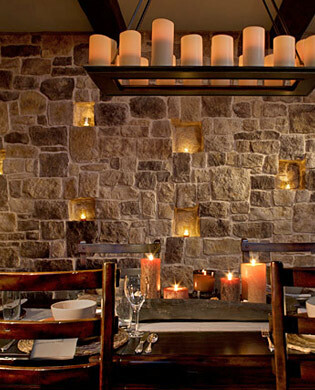 And now you see why Eldorado Stone's CandleWall has been added to my ever increasing "House Wish List". If you like this design technique, you'll need a relatively big wall that you can fully devote to the transformation. Floor to ceiling works best, whereas the width can vary. Ten feet in between two windows, as seen in the second picture, is perfect. If you have a large wall, imagine the impact!